I thought I would share my wood baby swing refinish with y’all. Our grandchild is now 7 months old and it was time for a swing! I mean you have to have something fun to do when you come to the grandparents house right? 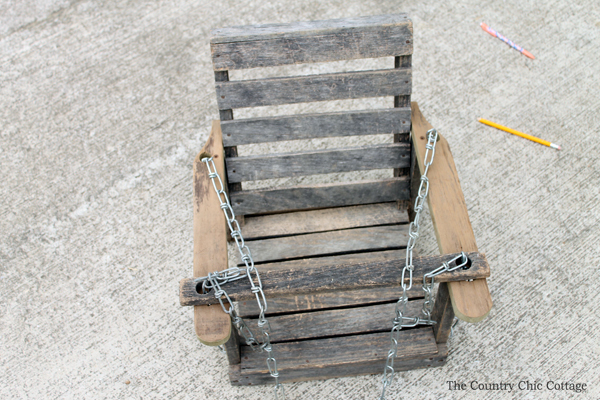 So I picked up a dilapidated swing for a few dollars at a yard sale. I was so happy with the end results that I decided to snap a few pictures for you. 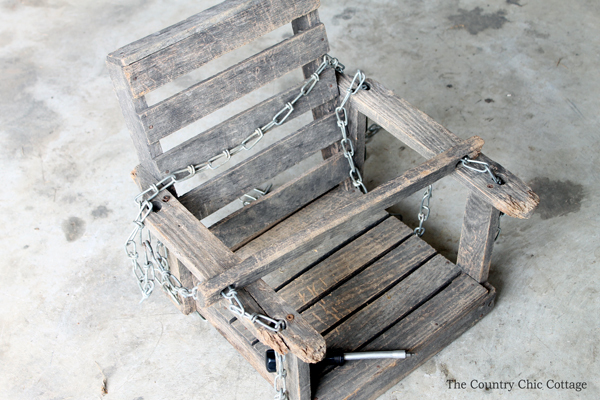 So if you want to refinish some old weathered wood, give my method a try! First you can take a look at where I started. This swing had definitely seen better days. But I picked it up for about $5. It was well worth that to me! 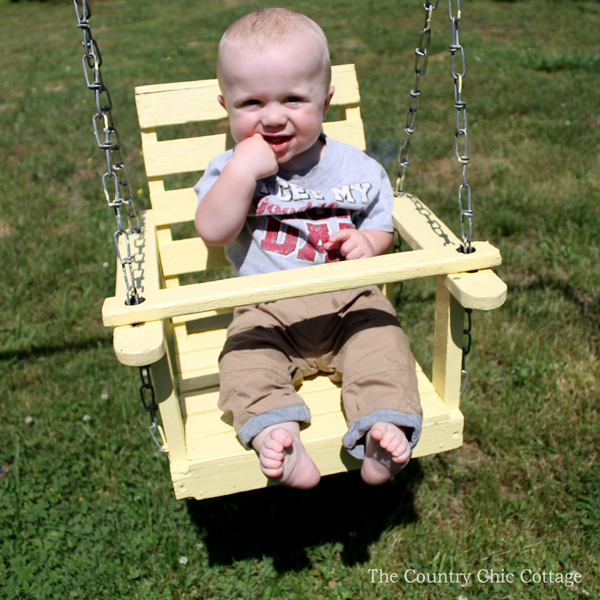 If you can’t find your own bargain, you might try making your own baby swing. Also, just so you know, the links in this post are affiliate links which means a portion of your purchase will go to support this site. I first replaced both arms with a similar worn wood. It was actually some barn wood from one of the barns on our farm. I just used the existing arms as template and my trusty Rockwell Blade Runner to cut them out. I then gave the entire swing a light sanding with a palm sander. I cleaned up the swing with a tack cloth to make sure I got any dirt and sawdust. 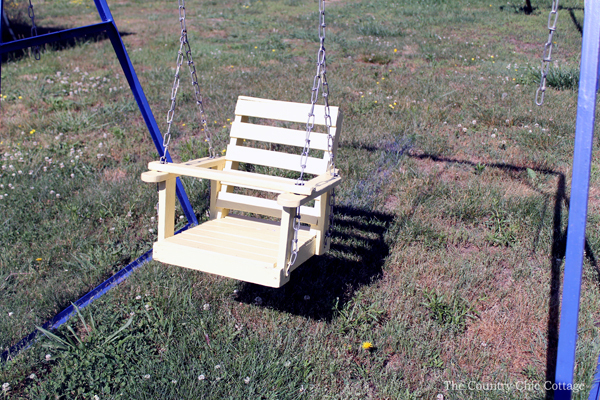 I then used Americana Chalky Finish in Timeless to give the swing some color. Seriously it took me two coats to completely cover up that old wood! I then used the Americana Decor Light Satin Varnish to protect the swing for outdoors. You can use as many coats of this as it takes to get a nice smooth finish on your project. Just be sure to follow the directions on the paint and varnish. My son found an old metal frame that was rusting on part of our land. I finished it with some blue spray paint I had on hand. We then hung the swing from some hooks and this one was ready for some action! The swing was a hit! This wood baby swing refinish was a bit time consuming but so worth the effort! 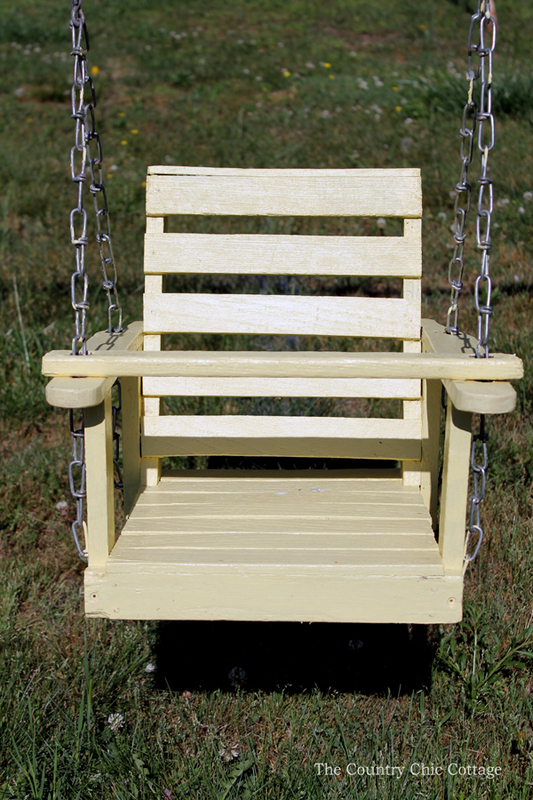 I love that the little swing looks like a beach chair now with the yellow finish. So much better than a plastic swing don’t you think? And I get to be the fun grandma that has a great swing at her house! 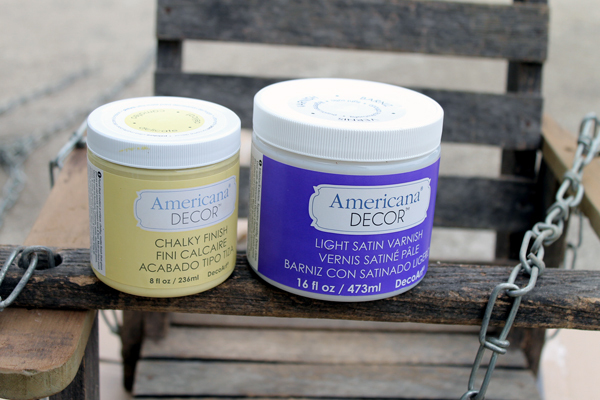 Give the chalky finish paint and varnish a try if you are looking at refinishing any old wood projects. It worked great for this wood baby swing refinish and I know it will work great for your project! As anything you do Angie you do so well. Great job re-habbing that baby swing, looks like new now. 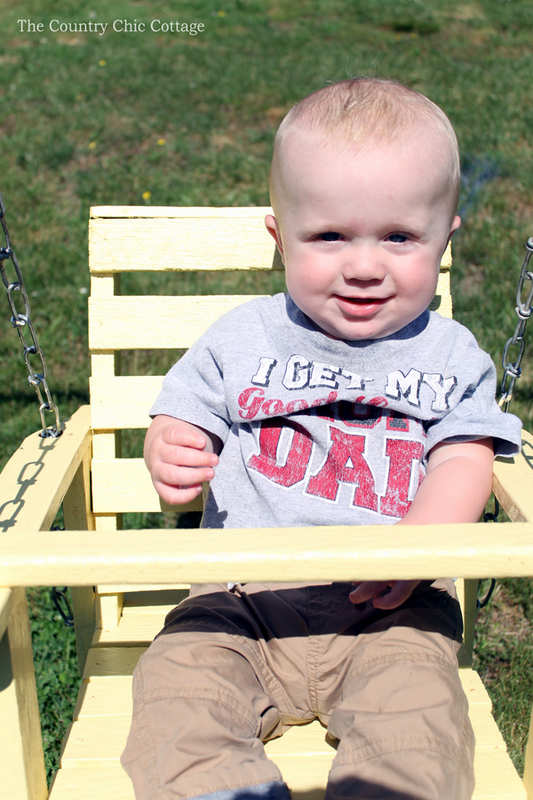 One concern I had was varnish on swing, will that make adorable baby sick if he chews on front crossbar or arms? I have no idea how varnish is made but was wondering about that. The paint should be okay but that darned varnish made me wonder. OK can throw a rock at me. Thanks Jane! The varnish is not going anywhere! It shouldn’t make him sick at all! If you are going to have wood outside, it is necessary!